Who else is looking forward to returning to the wizarding world of J.K. Rowling when Fantastic Beasts & Where To Find Them arrives at theaters across the United States on November 18, 2016? Fan of the Harry Potter books and movies will find themselves transported back to this magical realm, but this time are visiting it decades before the birth of the famous boy wizard who became a world phenomenon within the Muggle -- people who lack any sort of magical ability -- community. Fantastic Beasts & Where To Find Them was referred to as a Hogwarts School of Witchery & Wizardry text book in the Harry Potter book series and is the inspiration for this original movie which was scripted by J.K. Rowling and is her screenwriting debut. 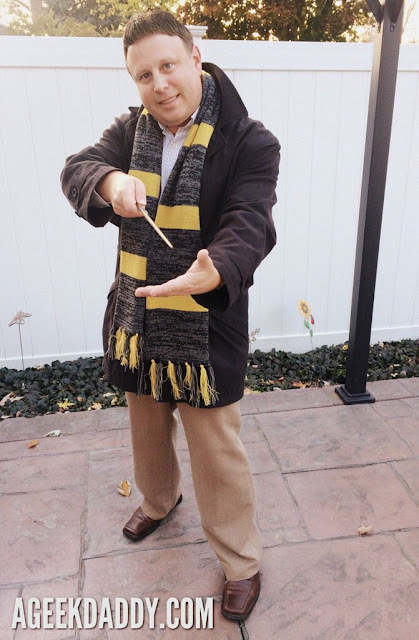 To help get A Geek Daddy in the mood to go see Fantastic Beasts, Warner Brothers Pictures kindly provided me authentic recreations of the scarf and wand associated with the main character in the film, Newt Scamander. I'm all ready now to conjure up a good time by going to see this film when it appears at movie theaters -- Accio Fantastic Beasts & Where to Find Them! Fantastic Beasts & Where To Find Them takes place in 1926, and Newt Scamander (Eddie Redmayne) has just completed a global excursion to find and document an extraordinary array of magical creatures. Arriving in New York for a brief stopover, he might have come and gone without incident, were it not for a No-Maj (American for Muggle) named Jacob, a misplaced magical case, and the escape of some of Newt's fantastic beasts, which could spell trouble for both the wizarding and No-Maj worlds.